I love old farmers. when I'm around them, I feel like a little girl again, spending time with my Big Daddy riding around in his ancient truck. There's a timeless feeling about being in the company of older men who've spent their lives in total harmony with the earth and her seasons. I have no argument with the modern farmer – he's tech savvy, educated and a true businessman. He zips around his mega farm in a four-wheeler, keeps in touch with every part of this operation via cell phone, computer, walkie-talkie, and GPS system. He can punch in some numbers and tell you exactly how much water she drank, how many pounds of milk she gave today, and when her projected cull date is from his multi-thousand animal herd. The old farmer didn't think of her as a number but as Queenie or Bess, or at least, as the mostly white-faced one that liked to twitch her tail in you face when you washed her udder. that's right, back in the day, calves didn't have their tails snipped off at birth, and if you had one who liked to be playful with hers, you either held it out of your way or put up with the slaps you got. The modern operator is never far from his computer, and works with a broker to nail down the best and least expensive source of feed, delivered on a highly effective “on-time delivery” basis. the old farmer kept a watchful eye on his fields of oats, corn and hay all summer, and timed the harvests accordingly. the hay mow, granary and silo were filled once a year, and he knew exactly how much he had to draw on through the winter. If he planned poorly or the weather didn't cooperate, he had to buy feed to get through. The young guy has frequent meetings in his office to go over the schedules for all his employees, to review the statistics on calves born and sold off, cows rebred, and the hundreds of heifers he has boarded with a neighbor who now specializes in getting those animals raised and bred for when their time comes to join the mega herd. He's on top of the game, and keeps lots of plates spinning at the same time. The older guy knew every animal personally, remembered that Candy had a tendency to deliver big, healthy heifers, and that Suze was a slow eater and always had to be in the end stanchion. He kept horses – Buck, Daisy, Janie and Captain – and still used them occasionally, just to keep his hand in and to justify keeping them around. He had a tractor, of course, an old one, and just the one, and he spent a lot of time tinkering to keep it running. It was a great advancement, but there was nothing like walking or riding behind his perfectly trained team to keep him in touch with every square foot of his property. The modern dairy is highly segmented and each part of the operation is managed by a specialist, be it milk production, feed programming, field work and crops (if the feed is not all purchased), calving and animal care. The old farmer took care of all those things by himself, or with the help of his wife and children. Hopefully there was a houseful of them – rowdy, muscular boys and energetic girls eager to help with the household and the younger siblings. The young guy has a couple of kids who never set foot in the barns, being so busy with soccer practice and dance lessons and computer games. Like any other child in our modern times, they are not part of the family livelihood, and in a lot of ways, that's a real shame because they never experience the labor that goes into it. The old guy had an old dog, who took every step he took, and who lived to catch a ride in the old pickup parked in the yard. He or she slept in the barn with the other animals, and was sure to let him know if anything were amiss. The barn cats met him every morning and evening at milking time, and in return for warm hay to sleep in and pan of creamy milk twice a day, they kept the mice and other critters at bay. The modern dairy professional would no more allow a dog or cats in with the herd than fly overhead dropping confetti among the stalls. The next time you're at the local fast food restaurant or gas station/snack bar, on a cold, frosty morning, pay close attention to the group of retired farmers at “their” table by the window. These old guys meet one or more times a week, to drink coffee, tell tales, and reminisce about the old days. There may even be a bit of gossip going around the circle, and some inside jokes that bring chuckles to them all but are bewildering to the casual bystander. I have nothing but respect for the modern dairyman, who has such a challenging job in such a challenging industry. But I love the old gents, who've walked the walk and talked the talk for decades, and who still feel the stir and longing when winter's end signals the time for rebirth on the land. This post is reprinted with permission from Kate's Corner by Kate Lydon (kates-corner at hotmail dot com), originally published in The Denmark News on April 26, 2012. 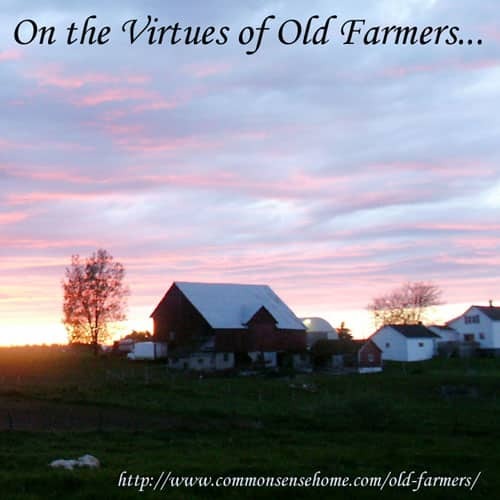 I asked Kate's permission to share it with my readers because it spoke to me, bringing back memories of my own experience growing up on a small dairy farm in northwest Wisconsin, and the new realities of the modern dairies that now fill the countryside. Couldn’t agree more. Especially about listening in on their early breakfast conversations. Actually any table of old men at breakfast are usually entertaining. My FIL does such a thing every Wed. morning like clockwork, he & his other 80+ gentlemen friends go to a local fast food company for biscuits. When asked why they don’t go to a sit down restaurant, they say why would they when the staff at this restaurant comes around & offers refills of coffee just like a regular sit down restaurant. Plus, with coupons, their breakfast usually come in under $2. Most of these men were business owners in our area & have no problem w/$$ but it kills them to actually spend any of it. Especially on something like fancy breakfasts. I feel the same way about the old farmers. I have frequented diners where the farmers visited in the early mornings and listened to their stories. Technology is great and all, but it also worries me that we may not remember how to survive without it if something drastic occurred. Like many others I am learning how to take care of chickens and use them in the garden by reading in magazines when that knowledge used to be learned first-hand at home. I love them too & owe so much of my childhood to their world, the world they made possible that was filled with wonder, love, work, fun and LIFE! One particular farm in Wisconsin was always open to us as really young kids, we were allowed to play in the barn like another litter of kittens, and survived a few harsh winters with the big stainless steel container of warm milk they gave our family weekly . We dragged it across the road & through snow drifts in the field like the precious gift of life it was and eagerly drank the cream that rose to top the next morning. Thank you, thank you , thank you…. I just learned to work and drive draft horses in May at a local farm, Fair Winds, and find a connection that is unexplainable and indescribable. I just know, with every fiber of my being, that draft horses are what I must work towards. I wish I knew some old farmers that wanted to share what they know. So much will be lost when that generation shuffles off this mortal coil. And sadly there are very few of the generation coming up that are interested. Although there are more now than ten years ago. Maybe there is hope yet. The economics of small farms today are tough, but there is a renewed interest.